I don’t drink a lot of beer, and it’s never my go-to choice if I ever visit a bar or a dinner party with friends. However, there are some foods that are just so much tastier when paired with a beer. I’m not sure if it’s blasphemous or not, but for me, a beer with spicy Indian curry just makes the whole meal taste better. Sorry, purists, if that’s somehow not traditional or if it’s downright sacrilegious. Just pretend I’m talking about a British curry, and I think we’ll all be fine. So I wondered, what would happen if you added the beer as a part of the cooking process? 1. Steam the chicken breasts with hot water, 1/4 can of beer, and bay leaves. 2. Fry the onion in melted butter until translucent. 3. Add the garlic and curry spices, stirring constantly, for just a few seconds. 4. Add the rest of the beer and deglaze the pan if necessary. 5. Add the chicken (removing the bay leaves!) and beans, cover, and stew for about five minutes or until chicken is cooked through. 6. Add the tomato paste, stirring until well incorporated. Continue cooking uncovered, stirring occasionally for another 5 minutes or until most of the liquid is evaporated and the curry is saucy but not soupy. 7. Add the yogurt and adjust the seasoning if needed. 8. Serve over rice or with naan. As always, if you can let stand for up to an hour, the flavors will meld better. I like to steam the chicken in my microwave steamer, as it takes less time to make the dish overall and it does seem to be flavorful without overloading on oils for frying. You can fry the chicken directly, after the onions, if you want that seared chicken taste. The verdict overall? Well, the taste doesn’t really change that much from a “regular” curry, actually. There’s both a sweetness and a sourness, perhaps even more sourness than other curries I’ve made but it’s not overpowering. It makes the beer you drink with the curry even more tasty, though! And if you want a more vegetarian option, you can surely leave out the chicken with no problem. 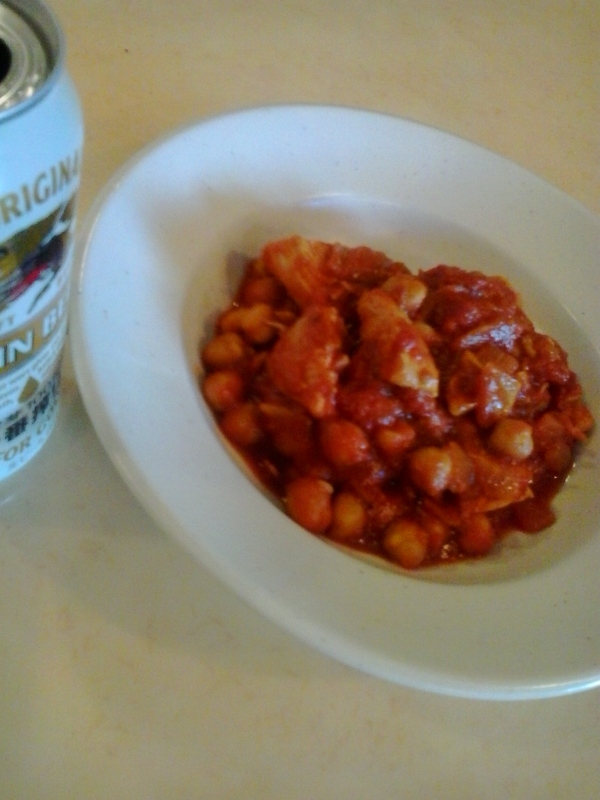 This entry was posted in Food and tagged beer, chicken curry, curry, recipes. Bookmark the permalink.